Pacific Power Model 3120AFX-4L / ACA TMetrix Inc. Rated Power 12000 (vA), Outputform 1,2,3Ø, Output Volt-Max 300(L-N)/425 (VAC/VDC)(1), Output AMPS/PHS 33.3/16.7 (AAC/ADC)(2), Input Power Form (3) 3 Ø, Panel Height (4) 4 (U) and Weight 112/51 (LBS./KG). SKU: 3120AFX-4L. 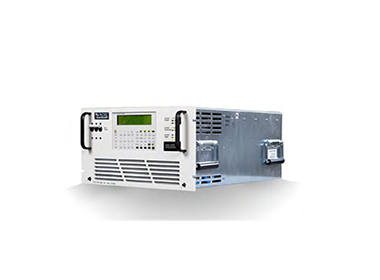 Categories: AC Power Supply, DC Power Supply, Pacific Power Source Inc..
All AFX Series power source models are equipped with a digitally Programmable Controller. Total control of the output power mode, phase mode (form) is available from the front panel or the bus. All operating functions may be controlled from either the front panel or from a remote RS-232, USB or LAN interface. IVI Compliant Instrument Drivers are available. Provides for exceptional accuracy of the AC and DC output Voltage. When enabled, accuracy improves to ±0.02% referenced to the power source internal voltmeter. More output current available at lower voltage setting without having to change range. Up to 16 different waveforms can be stored in the waveform library for execution as part of a steady state program or for substitution in any output phase as part of a transient test program. Memory locations #1 through #10 are a non-editable waveforms. Locations #11-#16 are editable and can be substituted in any output phase. An unlimited number of waveforms may be stored on the computer for those using a programmable UPC. Create and execute transients that occur over a specified time segment to modify the output waveform, voltage, and frequency for any or all phases. An output trigger is provided for synchronizing external test equipment to the actual transient event. Create and execute transients that substitute a waveform in any or all phases for 1 to 100 cycles. The waveform being substituted can be selected and/or modified from the waveform library. 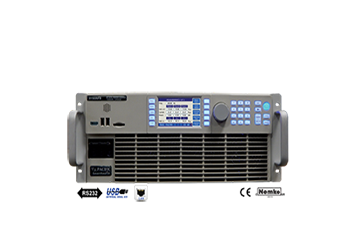 The AFX Series Power Source is equipped with several powerful Digital Signal Processors to create a fully integrated test system. 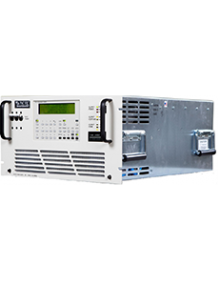 It supplies a variety of power conditions to the device under test and meters all output performance parameters. Special test requirements such the application of a DC offset on an AC line or AC ripple on a DC supply output are supported by selecting the AC+DC Mode of operation. 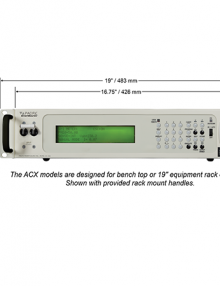 The AFX Series is an excellent source of stable AC voltage over the frequency range of 15 to 1,200 Hz. The output frequency is accurate to 0.01%. With the ability to provide singe, split and three-phase outputs, the AFX Series is the perfect choice to provide 1 Phase to 2 or 3 Phase or 3 Phase to 1 Phase conversion. Pacific Power Source offers rugged transit cases to protect your AC Source from adverse environmental conditions for mobile and/or military applications. Specific benefits: Environmental Protection (shock, vibration, moisture, heat), Unrestricted Equipment Operation, Quick Cover Removal & Installation, Integrated wheels and Handles, Stainless Steel Latches. Standard 19 inch rack. Slide rails are available as an option for all AFX units. See model table above for panel or cabinet height. Approximately 25 inch, from the front panel to the rear of the chassis. 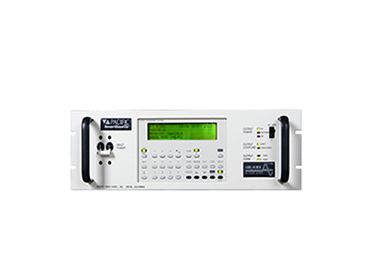 1 phase / 3 phase Selectable Output from front panel or bus command, 15 to 1,200 Hz. Operation – 5,000 Hz small signal bandwidth, Precision Voltage Programming – 0.05% with Continuous Self-Calibration (CSC) engaged, True-RMS metering of volts, amps, and power. 1 phase or split phase Selectable Output from front panel or bus command. • 15 to 1,200 Hz. Operation – 5,000 Hz small signal bandwidth, Precision Voltage Programming – 0.05% with Continuous Self-Calibration (CSC) engaged. As a member of Pacific Power’s AMX-Series popular family of high performance Linear AC Power Sources. 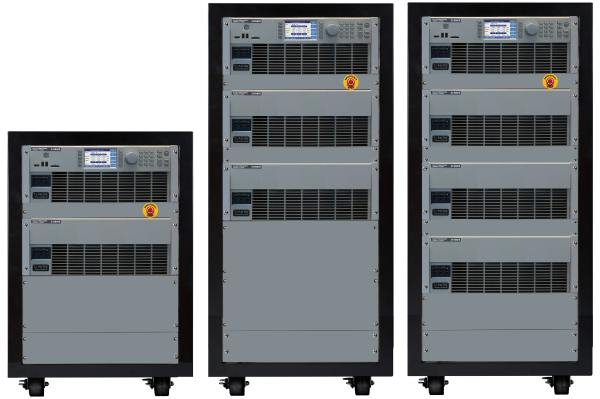 The ACX-Series consist of three compact, single-phase programmable AC power sources spanning a power output range from 1000VA to 1800VA.